The median selling price for a detached house so far this year has been $456,375, down 7.3 per cent — or more than $36,000 — compared with the same time last year. Real estate prices continue to fall in Calgary, with single-family homes leading the plunge. The median selling price for a detached house so far this year has been $456,375, according to daily sales statistics compiled by the Calgary Real Estate Board (CREB). That's down 7.3 per cent — or more than $36,000 — compared with the same time last year. Year-to-date prices are also down among other housing types, but to a lesser extent. Attached homes are 2.4 per cent lower to start the year, while apartment-style condos are off by 6.1 per cent compared with the first 10 weeks of 2018. Sales have also been sluggish, with just 2,252 homes, in total, changing hands so far in 2019. 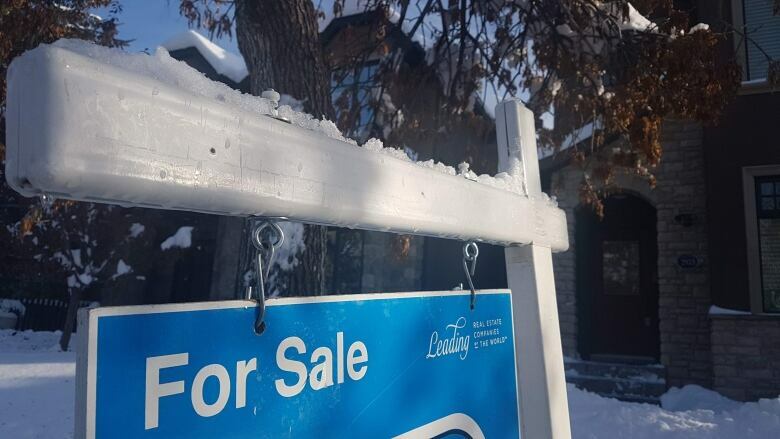 That's down 10.9 per cent from the same period in 2018, which was itself a slow year for sales, compared with long-term averages in Calgary. "Sales activity continues to remain weak ... and because we're faced with this persistent oversupply in our market, prices continue to trend down," said CREB chief economist Ann-Marie Lurie. A national look at real estate shows softening prices for single-family homes in most major centres. But Calgary's house prices fell the fastest in February, on a year-over-year basis, of 11 metropolitan areas monitored by Teranet and National Bank. 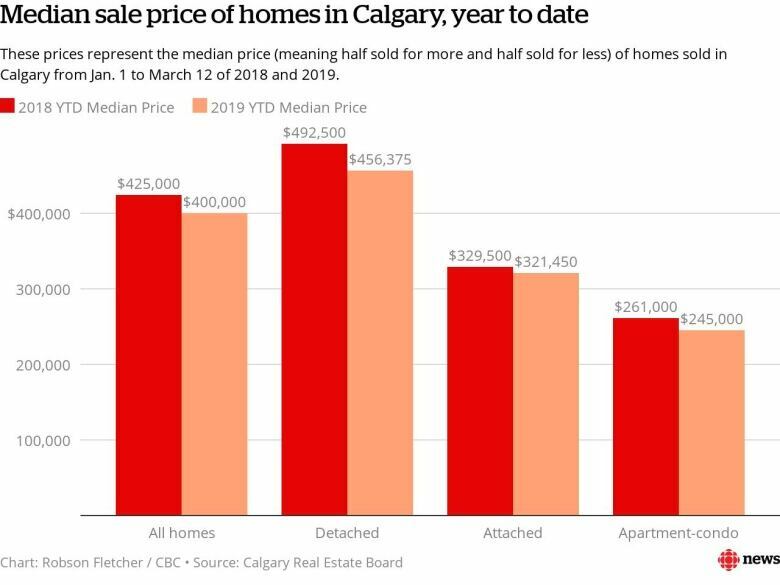 "For Calgary, it was the eighth consecutive month without a rise" in prices, the group said Wednesday in a report. Prices in the Calgary area were off 0.8 per cent on a month-to-month basis and down 2.7 per cent year over year. That's according to the Teranet-National Bank House Price Index, which is an estimate based on data collected from public land registries and limited to homes that have been sold at least twice. Most metropolitan areas saw price declines in February, according to the report, as the month marked one of the weakest on record for real estate nationally. "Except for the recession year of 2009, it was the largest February decline in 19 years of index history," the report said. Emma May, co-founder of Calgary-based Charles Real Estate, says the latest sales numbers come as no surprise. "Most of this aligns pretty much with what we're seeing out there in the market and on the ground," she said. "We know that buyers are sitting on the sidelines a bit more. We know they're taking their time." This trend, she added, isn't just a "Calgary-centric" phenomenon, but rather "something that's happening across the country." May believes federal changes to mortgage-lending rules are "definitely a factor" in the sales slowdown, both in Calgary and countrywide, as would-be buyers are facing stricter criteria when it comes to qualifying for large loans. Lurie said the relatively weak economic recovery in Calgary has also contributed to market conditions locally. She noted mortgage rates have also been on the rise, making it that much harder for people to borrow money and purchase a home. The declining prices can be seen as good news or bad news, May said, depending on your perspective. "For some people who bought when prices were really high, these are very stressful times. There's days where we go out and we meet people who bought three or four years ago and who now find themselves underwater and they feel trapped. They can't sell their house and they're losing equity," she said. "For other people, for people who are not in the market yet, it's an opportunity.... That said, some people also then question: Where is the bottom? How low are things going to go?"